How do I stop leaves blocking my gutters and valleys? Install a quality gutter protection system like NZ Gutter Protection’s Leafmesh that stops leaves from blocking the valleys and gutters. Why install NZ Gutter Protection’s Leafmesh system? Many people install gutter protection because it is too dangerous to climb onto the roof and clean the gutters themselves. Blocked gutters and valleys can cause major water damage inside the house. Roofers and builders in the insurance industry believe that most water damage to ceilings is caused by broken tiles and valleys blocked with leaves. Many insurance companies ask that gutter protection be installed prior to the repair of water damaged ceilings. Do I have to clean the gutters first? No, we do! It would be difficult to clean out the gutters after the installation had been completed, so we offer a complimentary clean with every gutter protection installation. Do we advise customers if their gutters are rusted? Yes, we would advise the customer if gutters need replacing or repair. NZ Gutter Protection can often recommend a suitable plumber to assist you with replacing or repairing your gutters. NZ Gutter Protection will arrange to complete the installation at a later date once the gutters have been fixed. Is Leafmesh made in Australia? Yes, Leafmesh by Tapex PTY LTD is 100% Australian made. We offer a 15 year warranty on this premium product. Will the mesh work on all types of roof? Yes! It can be fitted to any roof including longrun and all tiles. Leaves simply slide off instead of settling in your gutters. Will my gutter protection be visible on my roof? You may see a small section of the mesh because of the pitch of the roof. It is possible to install in-gutter systems that cannot be seen. However we have chosen not to include them in our product range as they create more work and are less effective. Why not an in-gutter system? If you want a low maintenance gutter protection system then we do not recommend in-gutter systems. In-gutter systems all require considerable mainentance as the leaves will not slide off but will sit on the mesh and eventually block off the gutters. We regularly replace failed in-gutter systems with our mesh. Who installs NZ Gutter Protection Leafmesh? We only use experienced Leafmesh installers. NZ Gutter Protection prides itself on quality installations that will last well past the warranty period. 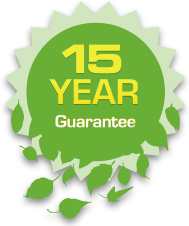 NZ Gutter Protection offers a 15 year warranty on all our installations. Our Leafmesh has been keeping leaves, bird and rats out of gutters since 2000. Will your mesh stop birds nesting in my gutters and roof cavity? Yes, a quality mesh properly installed will not only stop all types of leaves but will bird and rat proof your home. It will also stop flooding from hail. Does NZ Gutter Protection offer after sales service? Yes, we receive many referrals because our product works and we look after our clients. In areas where there is heavy debris, we offer annual or bi annual clean-offs at reasonable rates. How long does it take to install gutter protection? This depends on the size of your home, but installation for most homes takes 1-2 days.